Taking feedback into account I have slightly amended my proposal. I had presented this proposal on 29 March 2014 in Athens during a working meeting with DEA activists |1| and participants from other countries (France, USA, Switzerland, Belgium, Portugal, Italy, Germany …). I also presented a summary of this proposal at a public conference on 30 March 2014 where Panagiotis Lafazanis, presently the leader of the new Popular Unity party launched in Greece on 21 August 2015, also spoke. 1. Repeal the anti-popular measures imposed in the memoranda signed with the Troika after May 2010. This particularly refers to the reinstatement of dismissed workers following the imposition of these memoranda. 3. Socialize the banking and insurance sectors. Their own choices have now led most banks to a situation of insolvency and not just a temporary liquidity crisis. The decision of the European Central Bank and the Bank of Greece to protect the interests of large private shareholders only makes the situation worse. We must return to basics. The banks should be regarded as a public service, precisely because they are significant entities and their poor management can have a disastrous impact on the economy. The banking business is too serious to be entrusted to private bankers. Since it handles public money, enjoys the State’s guarantees and provides a basic service to society, the bank must be treated as a public service. The government needs to retrieve its ability to control and manage economic and financial activities. It must also have the means to make investments and finance public expenditure by drastically curtailing the loans from private institutions. For this, it must regain authority over the banks to socialize them, by transferring them to the public sector under citizens’ control, without compensating the major private shareholders. In some cases, despite the lack of compensation, the expropriation of private banks can be quite expensive for the State, due to their accumulated debts and the reserve of toxic assets. The cost in question must be recovered as much as possible from the global assets of large shareholders. In fact, private companies that are shareholders of the banks are the ones that caused this dismal state of the banking sector. All along they have been making substantial profits while holding a portion of their assets in other sectors of the economy. Now it’s time to seize some of their global assets. Private insurance companies should also be socialized. Although the situation of the insurance sector is less publicized, it is also bearing the full brunt of the current crisis. Large insurance groups conducted risky operations just as private banks did, since they move in the same circles. The major chunk of their assets consists of sovereign debt securities and derivatives. In search of maximum immediate profit, they speculated dangerously on premiums paid by policyholders, on their savings invested in life insurance or voluntary contributions for a supplementary pension. Expropriating the insurance sector will prevent a disaster and protect depositors and policyholders. This expropriation should function in tandem with the consolidation of capitalized retirement schemes. 6. Dissolve the privatization agency and replace it with a national asset management agency (with an immediate halt to privatizations) which will be responsible for protecting public assets while generating revenue. A transparent policy of public borrowing must be defined urgently. Public borrowing should aim at guaranteeing an improvement in living conditions, discarding the logic of environmental destruction. It must contribute to a redistribution of wealth and to reducing inequalities. That is why we propose that financial institutions, large private corporations and wealthy households be legally bound to purchase – commensurate with their wealth and income – non-indexed government bonds at 0% interest. The rest of the population can voluntarily acquire government bonds at an interest rate above inflation that will ensure a genuine and positive return (e.g. 3%). So if annual inflation is 3%, the interest rate actually paid by the State for the corresponding year will be 6%. Such a policy of positive discrimination (similar to those adopted against racial oppression in the US, the caste system in India, or gender inequality) will result in tax justice and less inequality in wealth distribution. 10. Contract a public loan from alternative sources (that is to say, excluding the Troika and the foreign financial markets) without accepting any conditionalities. 20. 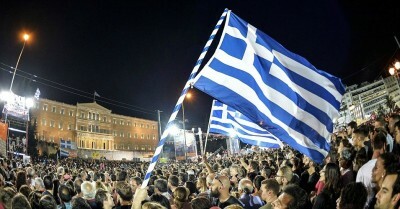 Withdraw Greece from NATO, discontinue the foreign bases on Greek territory and reduce military expenditure. Start negotiations with neighbouring countries so that a concerted process of demilitarization can be launched. It is essential to cancel the military cooperation agreement with Israel. Eric Toussaint is a historian and political scientist who completed his Ph.D. at the universities of Paris VIII and Liège, is the spokeperson of the CADTM International, and sits on the Scientific Council of ATTAC France. He is the co-author, with Damien Millet of Debt, the IMF, and the World Bank: Sixty Questions, Sixty Answers, Monthly Review Books, New York, 2010. He is the author of many essays including one on Jacques de Groote entitled Procès d’un homme exemplaire (The Trial of an Exemplary Man), Al Dante, Marseille, 2013, and wrote with Damien Millet, AAA. Audit Annulation Autre politique (Audit, Abolition, Alternative Politics), Le Seuil, Paris, 2012. See his Series “Banks versus the People: the Underside of a Rigged Game!” Next publication : Bankocracy Merlin Press, Londres, May 2015 (English version). Since the 4th April 2015 he is coordinator of the Truth Commission on Public Debt. |1| The DEA (Internationalist Workers’ Left) is a revolutionary Marxist organization and Syriza’s co-founder. With Kokkino and APO (anti-capitalist political group), two other revolutionary Marxist organizations, and with other independent activists, the DEA has created the Red Network group within Syriza. Kokkino and DEA merged in December 2014. The Red Network and the left-wing group inside Synapismos (Panagiotis Lafazanis being its most famous member) formed the Left Platform within Syriza. About 25 Syriza MPs (out of 149) directly participate in this platform (two of whom are from the Red Network). Approximately 30% of Syriza’s delegates supported this Platform during the convention held in 2013. During the July/August 2015 voting on the new Memorandum imposed by the Eurogroup, the MPs Elena Psarrou (DEA) and Ioanna Gaïtani (APO) as well as 23 members of the left and other Syriza MPs such as Zoe Konstantopoulou voted against. On 16 July, 32 Syriza MPs voted against the 13 July agreement. On 23 July, 31 voted against and on 14 August, 32 voted against. Now the Red Network is part of Popular Unity which didn’t succeed in electing members of the parliament in the anticipated general elections of 20th September 2015.